Sure, your new work boots are going to look great fresh out of the box, but that'll all change after a just few hard days on the job. 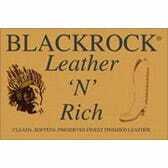 Keep your new or old leather work boots looking great with the help of Blackrock's Leather 'N' Rich leather conditioner. The authentic Carnuba wax nourishes and cleans leather, leaving it with a beautiful, mellow glow. Blackrock's Leather 'N' Rich works on all leathers, with the exception of suede, naked leathers, unfinished leathers, and glazed lambskin, so you can't say we didn't warn you. For every other kind of leather, especially exotic types, it's got to be Blackrock's.